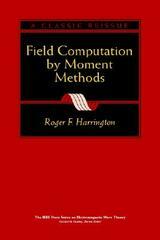 An IEEE reprinting of this classic 1968 edition, FIELD COMPUTATION BY MOMENT METHODS is the first book to explore the computation of electromagnetic fields by the most popular method for the numerical solution to electromagnetic field problems. It presents a unified approach to moment methods by employing the concepts of linear spaces and functional analysis. Written especially for those who have a minimal amount of experience in electromagnetic theory, this book illustrates theoretical and mathematical concepts to prepare all readers with the skills they need to apply the method of moments to new, engineering-related problems. Written especially for those who have a minimal amount of experience in electromagnetic theory, theoretical and mathematical concepts are illustrated by examples that prepare all readers with the skills they need to apply the method of moments to new, engineering-related problems.